If you look at the statistics, you might think that this game may be a barn-burner. In the Crusaders’ last three games, they’ve put up more than 30 points each time. Lehigh has eclipsed 30 point in their last two games as well. If it does end up being a high-scoring affair, it may end up echoing a Holy Cross/Lehigh game that took place twenty-four years ago, and is considered by many to be the most exciting non-Lafayette-related football game ever played at Murray Goodman Stadium. In 1991, Holy Cross was a Division I-AA powerhouse. Though Gordie Lockbaum had graduated much earlier, the Crusaders’ scholarship athletes kept Holy Cross’ 34 game winning streak over I-AA opponents alive. Lehigh, also ranked nationally, was the best chance for Holy Cross to be upset in many years. Both had some of the top offenses in I-AA. And in front of 14,055 fans, both teams treated the fans in attendance to an incredible show. We break down the Holy Cross game – and we give our fearless prediction, below the flip. If you’ve followed the Patriot League for some time, you know plenty about the wrangling that went on when the league was debating whether to change the existing financial aid structure to allow schools of the League to offer football scholarships that resembled, say, the same types of scholarships that Delaware or New Hampshire can offer. You could argue that this decision has completely altered the course of the Patriot League this season. On Lehigh’s depth chart, freshman LB Colton Caslow has stepped into the Mountain Hawk linebacking unit and forced his way into the starting lineup, and other impact freshmen like freshman DB/RS Brandon Leaks have pretty much been instant impact players since very early on the season. Additionally – amazingly, actually – of the six Patriot League schools that are now eligible to offer football scholarships (Fordham started offering them years ago), all six have seen a freshman attempt a pass in a game that counts. Two weeks ago, Lehigh freshman QB Nick Shafnisky finally got in a game and threw a pass. 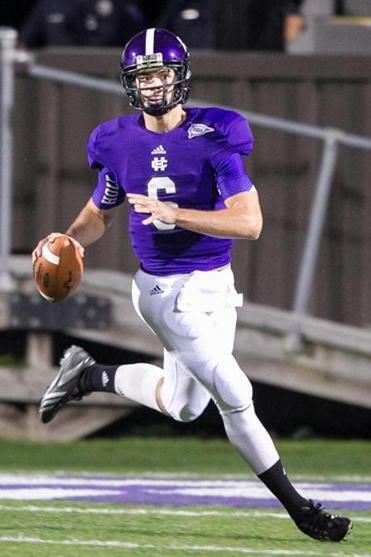 The Crusaders have a quarterback that is in serious contention for Patriot League Freshman of the year – and he’s the reason why Holy Cross is still alive for the Patriot League title.